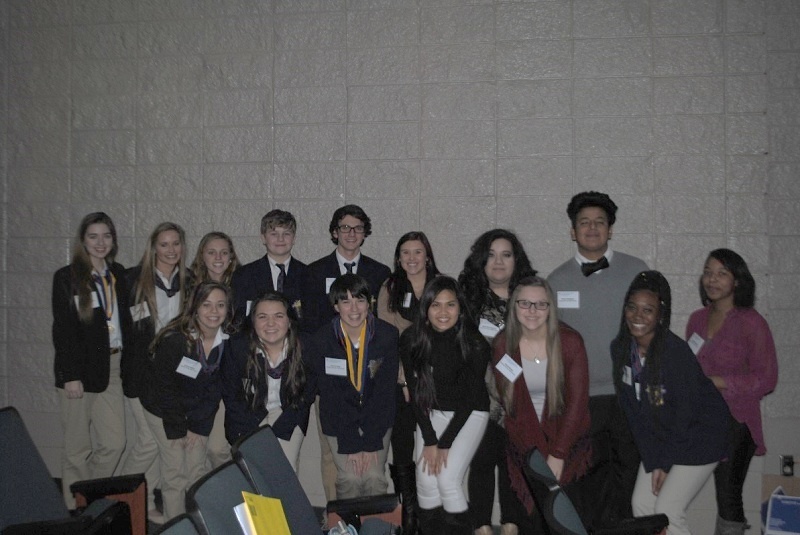 Appling County High School students attended the FBLA Region 2 Competition at Ware County High School on January 13th in Waycross, Georgia. Members competed in online objective events in December and then traveled to Waycross to compete in performance events. An awards ceremony was held on January 13th to acknowledge student achievement. Appling County had 18 students to compete in Region Competitive events this year. Eight students were recognized at the Awards of Excellence Ceremony. Members may compete in individual and team events. In online objective testing, Cami C. placed 8th in Business Calculations and Kenley L. placed 9th in the same event. Both of these individuals qualified to compete at State Leadership Conference in March. Performance events allow students the opportunity to share their presentation skills with judges. Emma B., Lexi H., and Caroline R. placed 3rd in Introduction to Business Presentation for their performance event. Cami C. competed in Public Speaking II and placed 2nd. The team of Kenley L. and Lynsey S. placed 2nd in the area of Business Ethics with their presentation on the use of animal testing on products for safety and human use ethical. Tyler T. and Brycen L. placed 2nd in Emerging Business Issues for their presentation on unlocked and jailbroken devices. Cami C., Kenley L., Lynsey S., Brycen L. and Tyler T. each earned a bid to compete at the State Leadership Conference March 6-8, in Athens, Georgia. The club’s advisers are Jena Cranford, Vickie Carter, and Alison Lamb. The students in the ACHS FBLA chapter will next participate in the state leadership conference in Athens, GA on March 6-8. Myself, as well as others, have caught a serious case of senioritis. With spring break and the end of the school year upon us, we just want to relax. A really nice treat for your members would simply be to give them a relaxation period. Add music and light refreshments and you may even have a small party. All you need is high energy atmosphere and you are guaranteed to have a good time. 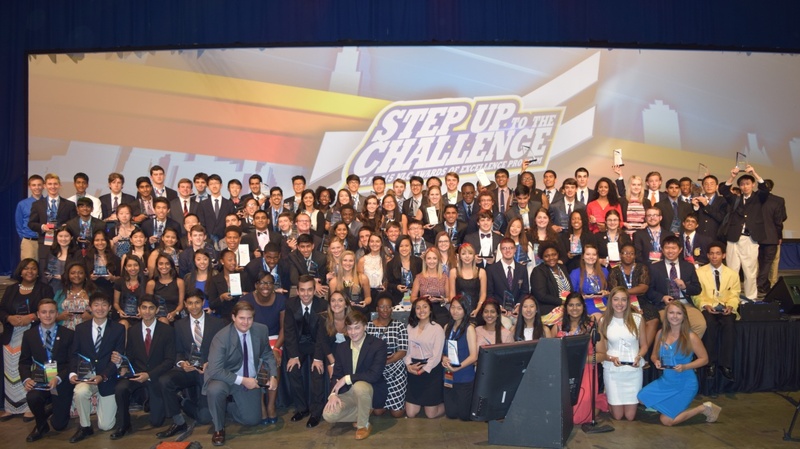 Last summer, almost 500 Georgia FBLA members and advisers embarked on the journey to Chicago, Illinois for the 2015 National Leadership Conference. Now, you have the chance to narrate your own epic at the 2016 National Leadership Conference, held in our very own home state! Chicago turned out to be the GREATEST National Leadership Conference ever as Georgia brought home 119 national winners, including 10 national champions. Now is our time to show why Georgia FBLA is the best. We are slowly approaching the next chapter in our novel, the 2016 State Leadership Conference. It is at this conference where we find out who will represent Georgia FBLA in Atlanta.Not only will you get to meet members from across the nation, but you will have the opportunity to explore Atlanta like never before. You do not want to miss out. Good luck to all of those competing for a spot to compete at the National Leadership Conference. Georgia FBLA chapters will be housed at the Hilton Atlanta. All housing and registration should be coordinated through the state office. In the meantime, check out this year’s NLC Promo! Are you a leader in your chapter? Maybe you want to run for an office in your local chapter, but at the same time you are not sure how to succeed in that position. Possibly you plan to run again for a position you have held before. Whatever the case is, be sure to come to the FBLA Summer Leadership and Officer Training Summit (SLOTS). At SLOTS, your chapter officers and leaders will work together as a team to plan ahead for the school year. They also will be split up into their rankings and sent to train with other chapter officers from different schools throughout the region. For example, all the presidents will go together for training in a separate room than the vice presidents. In each training room, the officers will learn how to reach their full potential for the upcoming school year. After the training session is over, the officers will then reunite with their fellow chapter officers and play some fun teamwork building activities that they can also use for their chapter meetings. Registration fees are $35 through June 15, and $45 after. Be sure to come to SLOTS! SLOTS is definitely something that your chapter will not want to miss!